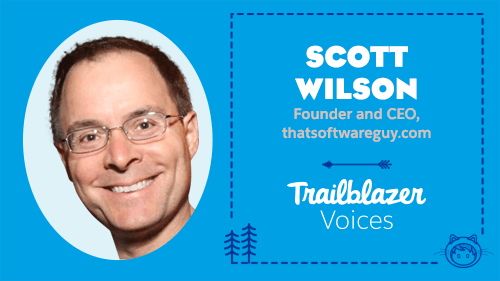 Scott Wilson is the Founder and CEO of thatsoftwareguy.com, an independent ecommerce software company that uses Salesforce Essentials, Salesforce’s CRM built for small business. A lot of things in life “just happen.” Some call it a coincidence. To me, it’s meant to be. My journey as an entrepreneur – along with my journey discovering Salesforce – were exactly that. Owning a business wasn’t a part of my life plan. In the mid 2000s, however, someone I had worked with during the tech recession got laid off. His next plan was to start a small business. He asked if I could help build an online shopping cart on his business’s website. I agreed to take on the job to develop his ecommerce business. At the time, not many shopping carts were available. Zen Cart was one of the best open-source options available – and I didn’t waste any time helping him set it up. In fact, I became really good at it – thanks in part to my computer science degree and 15 years of professional experience as a software developer. Remember that 15 years ago, many people who called themselves “web developers” had no real experience at all; they just knew how to put simple HTML tables together. Positive feedback, support, and encouragement like this is what led me to turn my hobby into a business in late 2006. Early on, the biggest struggle I had was figuring out how to balance running a small business while having a full-time job. I thought of this business mainly as a side hustle or a passion project, even though my long-term goal would be to grow it into something successful and influential. “Will I be able to handle the growth?” was a question that always popped into my head. At one point, my boss even said, “I don’t want you spending more than 15 hours per week on this side project of yours.” Unfortunately, 15 hours per week didn’t really give me the space to do as much as I wanted with my business. It was really a struggle defining what my time commitment on this business would be. Then, the answer presented itself to me: I was laid off from my full-time job. This gave me the opportunity to dedicate myself 100 percent to growing my business. How I discovered Salesforce for my small business is kind of funny. I was invited to apply for a full-time job as the Project Manager for a Salesforce implementation. I was doing my preparation, surprised to learn that Salesforce also had a CRM specifically for small businesses. I always thought it was an enterprise-only tool. Long story short: I didn’t get the job, but I sure got excited about Salesforce. In my mind, Salesforce is the category leader in CRM. Choosing Salesforce Essentials as the CRM for my small business was a no-brainer. I had no interest in managing an open source CRM product on my own, nor did I have interest in choosing a less popular CRM tool just because it’s a bit (but not significantly) cheaper. I wanted to work with the best because I knew it would help propel my business forward. So, I became a Salesforce Essentials customer and quickly created a set of tools to enable Zen Cart users to populate Salesforce accounts and contacts tables on their own. I released them as free open source products with the hope that they would be adopted alongside any other shopping cart solution. What I loved most about Salesforce Essentials is that it gave my productivity a boost by helping me organize all of customer my data is in one place (easily categorized by customer). 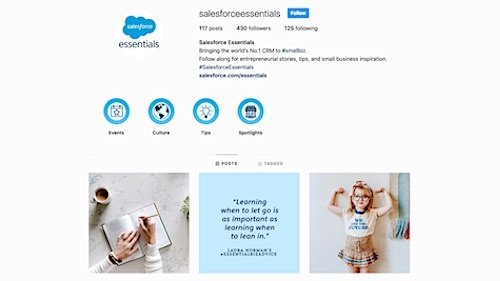 Before implementing Salesforce Essentials, I used a disconnected patchwork of other tools—Evernote, Google Drive, local directories on my Mac, etc.—to attempt to keep track of this information. Whenever I tried to find something, it ended up being an aggravating experience. Getting on-boarded onto Salesforce Essentials was pretty easy, too. The training modules on Trailhead were invaluable. I also became active in asking questions on community forums like StackExchange or dataloader.io. My next challenge is to figure out what else I can do with Salesforce Essentials since I know that, right now, I’m only tapping into a small percentage of its power. I’m definitely planning to dig into Trailhead to see what other great tools are waiting for me! Many people have a misconception about entrepreneurship. People think that being an entrepreneur means spending all your time doing what you love – whether it’s baking, plumbing, computer programming, or whatever. But you won’t! You’ll also spend a ton of time doing operations, business development, and sales to grow your business. The secret to success is learning to take pleasure in those things, too – even if they aren’t the most fun tasks – because they’re all part of running a thriving business. Your business starts with customers. It doesn’t start with a logo, an idea, or even printed stationery. It starts with your customers. Those are the people who choose to buy what you have to sell. Once you have customers lined up, everything else, more or less, falls into place. Without customers, however, all you have is a hobby, not a business. Don’t get me wrong, there's nothing wrong with hobbies. But if you want to have a business, you need customers – and you need to learn from them – their wants, needs, and expectations – every step of the way. Do as much as you possibly can yourself. As your business grows, it’s never a bad idea to get extra hands on deck. However, in the beginning, you need to build basic competence in bookkeeping, sales, marketing, product management, etc. 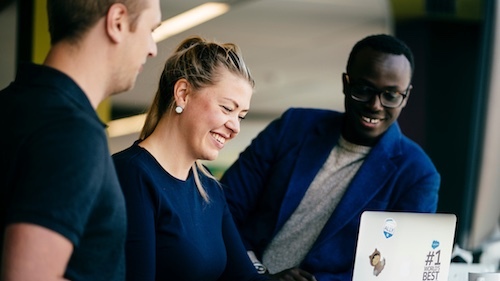 Building these skills on your own will not only make you more successful in the long-term but will also help you become a stronger leader once you begin hiring support staff. Not to mention, it’ll save you money. You may not like doing these things very much – and that’s okay. Just think of it as an investment in your business’s future. It will pay off! Are you a solo entrepreneur or small business owner looking for a CRM solution? 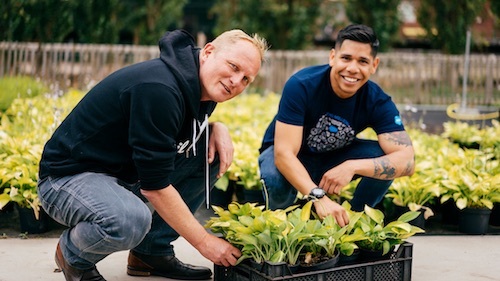 Learn how Salesforce Essentials can help your business just like it helps Scott. Salesforce can help you find customers, win their business, and keep them happy, so you can grow faster than ever. Learn more about our small business CRM solutions by following us on Twitter at @SalesforceSMB or on LinkedIn at Salesforce for Small Business. Join the conversation today with #SalesforceEssentials.